Cool Touch Oven Rack Guard (2-Pack): Eliminates burns from hot oven racks. Even if you use pot holders when reaching into a hot oven, the top of your hand and wrist are still liable to get a nasty burn from the front edges of your oven rack. The Cool Touch Oven Rack Guard easily snaps on to the front of any standard oven rack to protect you from these little catastrophes. The guard's material is the same used to protect firefighters, so you know it will remain safe in the hottest of temperatures. 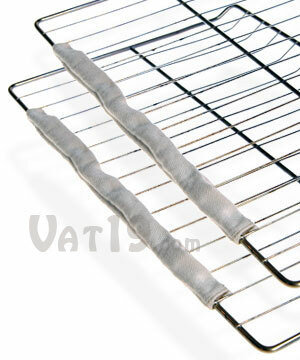 Two 18" oven rack guards are included with each purchase. The guards are machine washable and only need to be removed from your oven during a cleaning cycle. Your wrists and arms are susceptible to burns from hot oven racks even when you're using pot holders or short oven mitts. 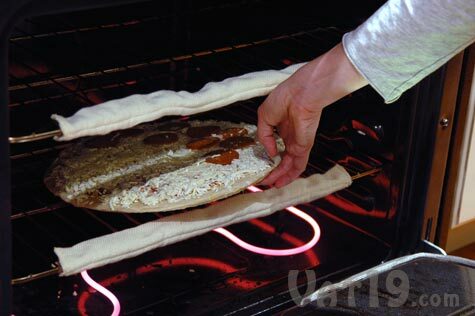 With a two-pack of the Cool Touch Oven Rack Guards, you can easily eliminate the potential for a nasty oven-rack burn. is safe up to 500 degrees Fahrenheit. 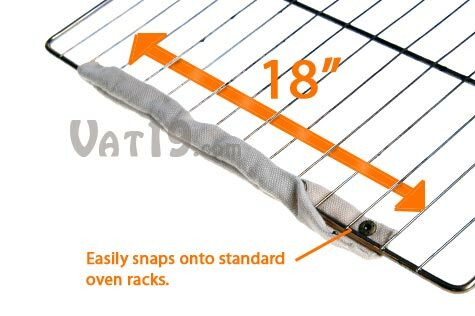 Each of the two included Cool Touch Oven Rack Guards is 18 inches long and snaps easily to the front of all standard oven racks. They can be left in place between uses, only to be removed when you are running your oven's cleaning cycle. If they should become dirty, simply toss your Cool Touch Oven Rack Guards in the washing machine. Machine washable oven rack guards are a "snap" to install (pun super-intended).